Slip (noun) is a liquefied suspension of clay particles in water. It differs from its very close relative, slurry, in that it is generally thinner. Slip has more clay content than its other close relative, engobe. Slip is usually the consistency of heavy cream. Slip is often used in decoration. It may be left the natural color of the clay body from which it is made, or it may be colored with oxides. It is applied to wet or soft leather-hard greenware. Slip may also be used for casting clay in plaster molds. Casting slip almost always has added ingredients to keep it in a uniformly consistent suspension until dried. Slip can be made from scraps from your clay body. Soak them in water until they have softened into a slurry and then stir and screen it through a mesh to remove any lumps. Apply it to scored surfaces you want to join together on your greenware. Sometimes this is called slip-slurry. There are many ways to use slip to decorate ceramic pieces. A more liquid slip can be brushed on, sprayed on, or pieces can be dipped in a container of slip. A thicker slip can be trailed onto the object using a condiment bottle or other trailing applicator. Multiple layers of slip can be built up to make intricate designs. Slip can be made of differently-colored clay, or you can add colorants to the slip. You may want to use a recipe for a slip base that uses ingredients such as kaolin, flint (silica) and nepheline syenite in addition to color ingredients. 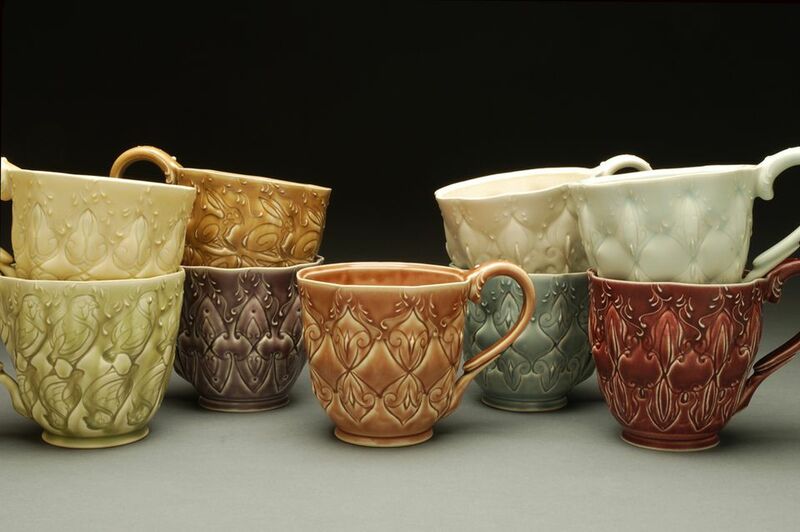 There are a variety of commercially available dry slips that you may see listed in a clay body recipe, including Alberta Slip, Blackbird Slip, and Ravenscrag Slip. You may want to mine local clay to use as slip or as the clay body for your piece, adding a local touch. Slip painting matches the clay's shrinkage better than adding other thicker paint or glaze after firing. It is also applied before the bisque firing and is bisqued along with the object. Then you can use further underglazes and engobes to define decorations and images before the final firing. This pottery method uses an absorbent plaster mold. The slip is poured into the mold, and the water is absorbed, leaving a layer of clay deposited from the slip. The mold is opened, and the clay object is removed. It may be either solid cast, where the form is completely filled with the new clay object, or hollow cast, where the new object is deposited around a hollow center, from which the remaining slip is drained off for reuse. Deflocculants are often added to the slip used in these processes, such as sodium silicate. When these are used, the slip can contain more solids. Is There a Difference Between Pottery and Ceramics?